One of my favorite dishes around Christmas courtesy of my aunt is gelatina de leche. This dish is similar to panna cotta, using canned condensed and evaporated milk prevalent in many Mexican desserts. With the holiday just being with the immediate family this year I decided I couldn't go without it. I decided to go with 3 layers featuring some of my favorite gelatine flavors. 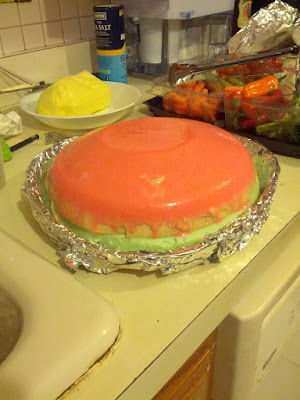 The bottom layer of the dessert was strawberry, which was easily accomplished due to my use of a large packet of Jell-o. This was an experiment of sorts to see if i can simply add the mix to some heavy cream and half and half and thankfully it worked! To accomplish this i boiled 2 cups of heavy cream, stirred in the strawberry Jell-o and stirred in an additional 2 cups of half and half. Normally i'd recommend using a combination of cream and milk but i really wanted to the richness for the holiday. The second layer was the traditional vanilla/cinnamon flavored white layer. I began preparing this after the first layer had set. For this I heated 1 can of evaporated milk, 1 can of condensed milk and a cup of half and half. In a separate boil I blended 4 packets of Knox flavorless gelatine in 1 cup of cold water. I poured the gelatine into the milk mixture along with a teaspoon of vanilla extract and a 2 teaspoons of cinnamon. Using a stick blender I made sure everything was well combined. I let the mixture come to room temperature before pouring onto my strawberry layer. The third layer was prepared the exact same way but instead of vanilla and cinnamon I added pistachio extract, almond extract and some green food coloring. Again i waited until the other two layers were set before proceeding. Though a bit time consuming I was very pleased with the results. All the flavors came out great and the color was beautifully perfect for the season. I also attempted to unmold the gelatine, it was slightly uneven but still made for a good presentation. My family was very happy with the dessert and I got my gelatina de leche fix after all. I will post a recipe soon to http://recipes.comalcaliente.com soon!